Singapore. 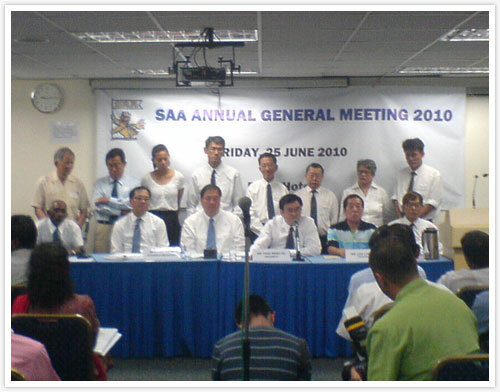 June 25, 2010: The 2010 Annual General Meeting of the Singapore Athletic Association this evening saw the elections for the association’s new Management Committee. In his acceptance speech, incoming President, Tang Weng Fei, thanked Loh Lin Kok who stepped down as SAA President “I want to pay tribute to Loh Lin Kok who has served as President of the association for 28 years. He has led the association through numerous competitions and events and has demonstrated a passion for athletics in Singapore and I thank him and the outgoing management committee for their commitment”. The AGM saw Loh Lin Kok elected as SAA Honorary Life President. Tang Weng Fei also commented on the incoming management committee “The team that has been elected, together with the team of advisors, are passionate individuals who come together with no personal agenda. We will ensure that whatever skill set exist in the athletics community, we will identify and they will be harnessed to good use to benefit the sport”. solid foundation of excellent interaction between all organizations and individuals in our eco-system of track and field”.